Score your club up to $10,000. 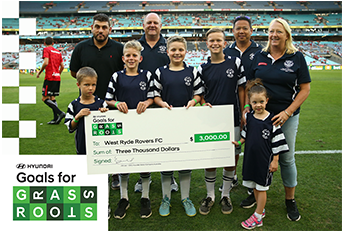 Hyundai Goals for Grassroots was created to provide financial assistance to junior football clubs and encourage kids to play the sport throughout local communities across Australia. During each round of the Hyundai A-League season, one match is designated as the ‘Goals for Grassroots’ game. In this match, the selected junior club is issued with an array of match day benefits including match tickets and receive a guaranteed $1,000 grant plus an additional $1,000 for every goal that the home team scores (up to maximum of $10,000 per game). Junior football clubs simply complete the online registration form telling us why they should be selected for a Goals for Grassroots grant. All eligible entries will be reviewed by a Hyundai Help for Kids panel and junior club grant recipients will be selected based on the worthiness of the application.